There are some handy people in Los Angeles would rather paint their own homes. It’s fun, challenging and you get to work on your schedule and style. 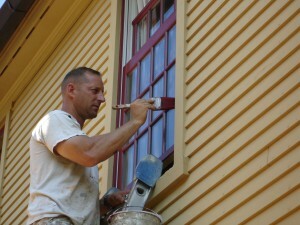 But if you are a very busy person, hiring a professional painter Hollywood might be the best option for you. Hiring a professional painter is very advisable especially if you have no idea what you are doing and have no time to do it. But before you write that check and sign that contract, there are some characteristics of a professional painter you need to hold dear to you. The list below will help guide you towards the right professional. A professional painter needs to be very punctual. He/she needs to be able to meet set deadlines and the only way you can verify if they are even worth your time is by asking for an interview. If they show up promptly for the meeting, it’s a good sign. Ask them how long the project will take and how they intend to go about making sure the deadlines are met. Painting a house is a messy business, especially painting a house with furniture in it. A professional painter needs to show absolute care when it comes to your valuables. They need to properly wrap them up so as not to get any paint on them. They should also be able to move the furniture around without damaging them or your floor. The best way to find this out is to verify their references. It’s your house, and your style should matter. That being said, there are some colors that just don’t go well together. A professional painter will work with you to find the right color for your house and the various rooms you need to paint. The brand of paint matters a lot, the higher the quality of paint, the better the outcome. Although that sometimes depends on the painter’s workmanship. Elegance comes up often in Hollywood. Your choices matter and your painter should be able to work with you to reach an amicable choice that works with your style and budget. You are the customer. Your satisfaction is all that matters here. Unless the painter is focused on making sure that you get exactly what you want, they are not the right kind of professional you are looking for. Hiring a professional painter in Hollywood should be an exciting project considering you are giving your home a new look. But in your excitement, be sure to choose the right one. Someone who will give you exactly what you want. The final outcome should be exactly as you envision it. The above pointers will help steer you towards hiring the right one.